What’s happening? Where is it happening? How is it happening? Presenting UpGrad Trends to Tend where we talk about news, views and opinions across the data, digital & tech industry. 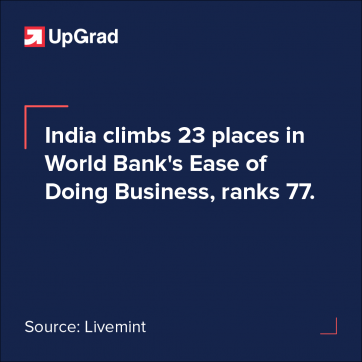 As per a report by Livemint, among 190 countries surveyed, India ranks 77 in the World Bank’s Ease of Doing Business 2019, climbs up 23 places. India became the only country to rank among the top 10 improvers for the second consecutive year. Earlier India’s ranking improved 65 places from 142nd in the year 2014 to 77th in 2018, a record for a major economy. Last year, India jumped a record 30 places to reach the 100th position in the rankings. Bloombergquint reported that industry bodies FICCI-NASSCOM and law firm EY have reported that, in the next five years, the entire job landscape would see a drastic change. 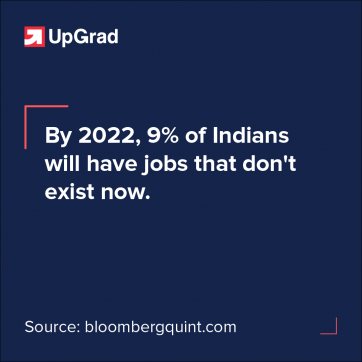 Due to new emerging technologies, it may lead to 9 per cent of the country’s 600 million estimated workforce being deployed in new jobs that do not even exist today. It is also said, 37 per cent of the workforce would be in jobs that would require primitive skill sets by 2022. According to a report by Entracker, Flipkart-owned online fashion portal Jabong has laid off almost 75% of employees out of its current strength, as a part of the integration process with Myntra. Myntra’s chief executive officer Ananth Narayanan announced that an additional 250 employees would lose their jobs as Myntra and Jabong are combining functions from finance, technology, marketing and creative teams among others departments. 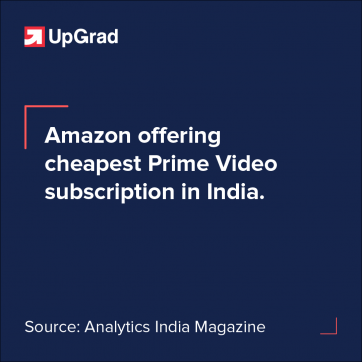 According to a report by Indiantelevision, online streaming platform – Amazon Prime Video has been found the cheapest in India among 28 countries. Ironically, the subscription is found to be the most expensive in the United States which is its home country with subscription costs around $12.99 per month which is almost $11.23 more expensive than India. Another study suggests Indian customers pay the lowest rates per title that is 137% less than worldwide average per title basis.